Professor Halfbrain has spent the last weekend with filling the squares of a $99\times99$ chessboard with real numbers from the interval $[-1,+1]$. Whenever four squares form the corners of a rectangle (with sides parallel to the sides of the chessboard), then the four numbers in these squares had to add up to zero. Professor Halfbrain has proved two extremely deep theorems on this. Professor Halfbrain's first theorem: It is possible to fill the chessboard subject to the above rules, so that the sum of all numbers in all the squares is $0$. Professor Halfbrain's second theorem: If we fill the chessboard subject to the above rules, then the sum of all numbers in all the squares is at most $9801$. This puzzle asks you to improve the two theorems of professor Halfbrain and to make them even deeper. Find an integer $x$, so that "the sum in all the squares is $0$" in the first theorem may be replaced by "the sum in all the squares is $x$", and so that "the sum is at most $9801$" in the second theorem may be replaced by "the sum is at most $x$" (again yielding true statements, of course). This is a sketchy proof of what Ivo suspected in the comments. Take an arbitrary selection as below. So, for an arbitrary selection, we know that the diagonal elements are equal. Taking an arbitrary selection with odd sides (e.g. $A+C+I+L = 0$), we know that $A,C,I,L$ must be equal and hence 0. Since this can be done for all squares, they must all be 0. 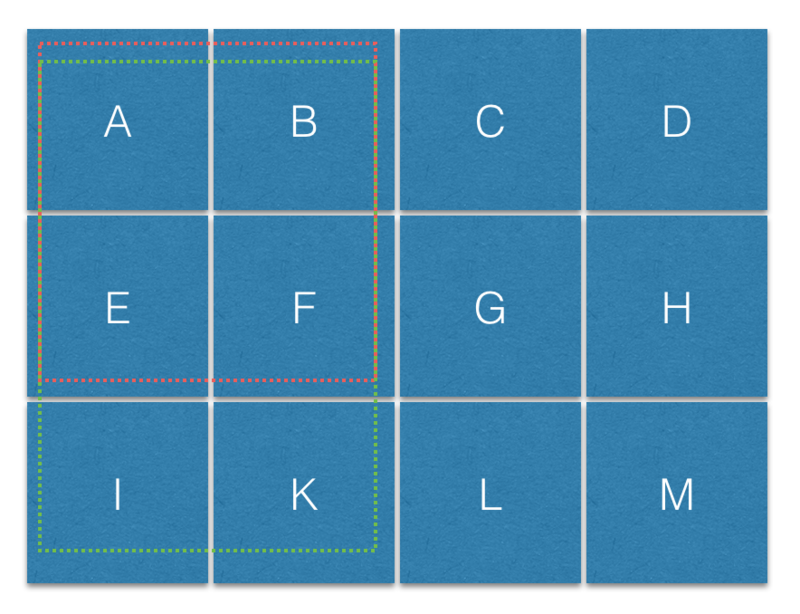 But now, consider a 3x3 square with $+a$ in one (and therefore all) corners. This gives $4a = 0$, so $a = 0$. Every square on the board must be $0$. We know that the sum of these four points is zero. Consider the two additional points $b_1$ and $b_2$. Since our choice of points was arbitrary, we know that any two points that share a side of a rectangle must be the opposite sign. The only way to satisfy these equations is if they are all zero. Thus (again since our choice of points was arbitrary) all the points must be zero.